As World War II came to a close, airlines and manufacturers began to shift their efforts to post war air transportation requirements. The mighty DC-3/C-47 along with the larger DC-4/C-54 transports provided airlines with many surplus aircraft, but there was still a need for new, follow on designs. After Consolidated and Vultee aircraft corporations merged, with their joined names contracted to Convair, they tried a variation of the B-24 Liberator with a single tail, new fuselage and 48 passenger capacity. This was designated the Model 101, or "Liberator Liner", which was tested by American Airlines, but never pursued due to its similarity to the many surplus C-54's available. American's requirement for a fast, modern airliner capable of 1000 mile range led to the development of the Model 110. This was a non-pressurized, two engine, low wing transport carrying 30 passengers and featuring an aft airstair for boarding at stations with minimal ground support. Only one Model 110 was built (reg-NX90653) because American wanted a larger aircraft to meet its route demand. 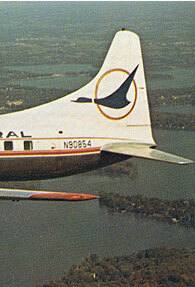 A redesigned, more powerful version was designated the Convair 240 (for 2 engine - 40 passenger). American was the launch customer in June of 1948 for the 270 mph pressurized airliner, ordering 75 units. Eventually, 176 CV 240's were ordered for the airlines along with a large order going to the United States Air Force with 390 being built as the T-29 trainer and C-131 transport. This model was still not commercially successful for Convair, so it was decided to lengthen the fuselage another 4 feet 6 inches to increase the capacity to 44 passengers. The 240 also lacked good performance for operating out of higher altitude airports, so the wing span was increased by 13 feet 7 inches and given more powerful 2400 hp Pratt and Whitney R-2800 engines. After the initial designation as the Model 240A, this aircraft became known as the Convair 340. Other improvements included a longer, more streamlined engine nacelle, a standardized passenger boarding door with integral airstair just aft of the cockpit on the left side and an optional weather radar. The first production model went to United Airlines in March of 1952 followed by another 186 built for the world's airlines and 124 going to other customers including the USAF and US Navy. Competition from other manufacturers, such as Vickers with their Viscount turboprop, led to further enhancement of the Convair series of twin engine, short/medium haul transports. In 1955, the Convair 440 (also known as the Metropolitan) rolled off the assembly line with added sound proofing both in the cabin and with a redesigned rectangular engine exhaust stack to muffle the more powerful R-2800 engines (rated at 2500hp). Most 440's now had weather radar as evidenced by the longer nose cone and an option for a high density configuration of 52 seats. Continental Airlines became the first operator on March 8, 1956 with Convair building a total of 199 units (92 to the airlines). Major customers for the 440 model were Eastern, Swissair and Sabena with the last production aircraft (N440M serial no.145969) delivered to the Superior Oil Company on July 16, 1958. 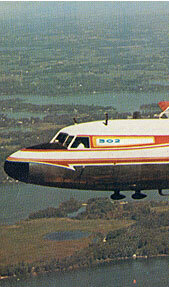 Many operators were also able to convert their 340's to 440's from a conversion kit provided by Convair. The usefulness of this airliner was further extended up to present day through the conversion from "recip" to turboprop power. Throughout the years, the versatility and ruggedness of the Convair series of medium airliners has proven it to be one of the most popular and long lasting designs in aviation history. Fueled by North Central's late 1958 award of an additional 18 cities and 2000 route miles from the Civil Aeronautics Board's "Seven States Area Investigation", a serious effort to find a suitable upgrade in equipment from the current all DC-3 fleet took place. While many local service carriers were buying the new Fokker F-27 turboprop, the one million dollar price tag did not sit well with President Hal Carr. Fortunately, Continental Airlines had five Convair 340's up for sale, and after some hard bargaining between Mr. Carr and Continental president Bob Six, North Central became the owners of those aircraft (reg #s N90852,N90854,N90855,N90857,and N90858) in early 1959 for $325,000 a piece. With an additional $80,000 spent on upgrading these Convairs to Model 440 specifications, the $405,000 total price was still well below the Fokker's cost, with the additional benefits of an extra 4 seats and larger cargo capacity than the F-27 could offer. Funding for these first aircraft was accomplished through a $2.34 million loan plus an additional $2 million working capital loan. Upgrades to each aircraft included a $12,000 muffler kit which reduced interior noise levels by 70% through a redesigned "rectangular" exhaust stack on the engines as well as added cabin insulation. Along with new interior furnishings, items for the refurbishment program included new ni-cad batteries, new VHF radios for navigation and communication, an upgraded RCA AVQ-10C weather radar and a redesigned galley. Soon, the first 50 NOR Convair pilots were receiving 40 hours of ground school with captains flying the aircraft for 8 hours minimum and first officers receiving 5 hours before revenue flights would begin. Stewardesses were trained for the new "Super Northliner" service at both Minneapolis/St. Paul and Chicago (Midway) bases with maintenance personnel also receiving extensive hands on training at these locations in addition to Detroit (Willow Run Airport). All five of these first Convairs entered service on the new April 26, 1959 schedule with emphasis on providing service to the newly acquired routes which had previously been flown by Braniff and Western Convairs. North Central's longest route (Duluth to Chicago) was also flown by the faster Northliner with additional service centered around NOR's main hubs of Chicago (Midway) and Minneapolis/St. Paul. The Convair fleet continued to grow during the next 8 years at an average rate of four per year with the 340/440's coming from such airlines as Delta, Braniff, LAN-Chile and National. Even though the Convairs were viewed as eventual replacement aircraft for the 32 DC-3's, the first 18 Convairs were used to help fill the rapidly growing route structure of North Central until the very end of 1963 when the "3's" fleet started to decrease. By 1965, the 28 CV340/440's made up 90% of the available seat miles even though there were almost as many DC-3's in the fleet. In order to properly maintain the new fleet, a new hanger designed to house the Convair was built in 1959 adjacent to the other facilities at NOR's headquarters at Minneapolis/St. Paul Airport. During 1964-65 as the CV340/440's came through this hanger for major checks, the capacity of the aircraft was increased from 44 to 48 seats. Even though these piston engine Convairs were doing a remarkable job of filling the needs of the "Route of the Northliners", the company had been studying the idea of a conversion available for these airliners to turbine power even before the first Convairs came on line in 1959. Although several engine types were available, North Central decided that the higher powered Allison engine turboprop would best fit their needs. In 1966, the airline signed an agreement with Pacific Aeromotive to convert 20 CV340/440's to CV-580's with an option for 11 more. Eventually, all 33 piston Convairs on the property were converted to "prop-jets" with an additional 2 purchased and converted starting in 1967. 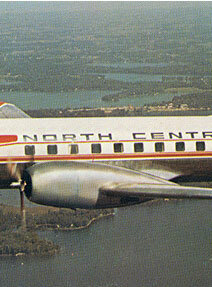 The addition of the Convair 340/440 series of aircraft brought the passengers of North Central the comfort and safety of an all-weather, pressurized/air-conditioned airliner for travel throughout the upper midwest.